The retina is the thin, light-sensitive layer of tissue that lines the inside back wall of the eye. When the vitreous gel pulls away from the front surface of the retina, a break in the retina is produced, if the vitreous is tightly attached to the retina. If fluid then goes through the hole, the retina pulls away from the wall of the eye, similar to wallpaper peeling off a wall, producing a retinal detachment. Because the retina receives a good portion of its nourishment from the wall of the eye, the vision decreases where the retina is detached. Typically this appears similar to a window shade being pulled across the vision. How is the Retinal Detachment repaired? 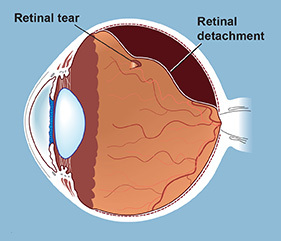 The retina must be returned to its position against the wall of the eye, and the retinal break must be sealed to prevent fluid from going through the break again. The retinal break is sealed by either laser or cryotherapy (freezing treatment). There are a number of ways to accomplish this reattachment, depending on the type of retinal detachment present. Approximately 95% of retinal detachments can be repaired, but it sometimes takes more than one proceedure to accomplish this. Usually there is good restoration of vision, but sometimes it is not as good as it was before the retinal detachment. As with any surgery, there can be rare unforeseen complications which can make matters worse, including severe bleeding, and serious infection. It should be kept in mind that retinal detachment is a serious condition, and can easily lead to blindness if nothing is done.